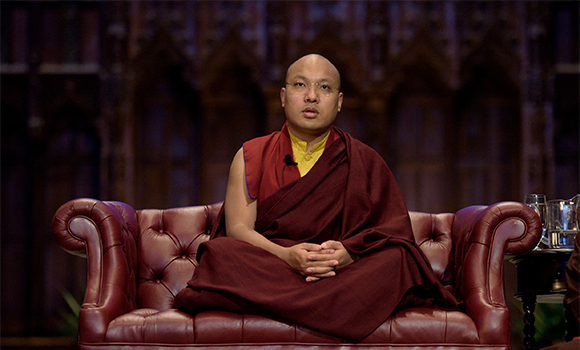 His Holiness the Karmapa’s last public talk of His second overseas trip was held in Kaye Playhouse at Hunter College, New York City, on July 29. The admission tickets were taken up quickly on opening day of the online ticket sale. On the day of the talk, many arrived at the lecture hall two hours early, intending to find a good seat in their designated area. Some arrived without a ticket, hoping to be lucky enough to attend the talk at the last minute. An article in that day’s New York Times, “A Young Tibetan Lama Prepares for a Greater Role,” no doubt stimulated interest in the talk among the public. Before 7:00 p.m., the seven hundred seats of the two-story lecture hall were filled completely. There were also about two thousand and five hundred viewers on the live webcast, waiting eagerly for this concluding talk of His Holiness’s visit. In the enthusiastic audience were Tsoknyi Rinpoche, Dzogchen Ponlop Rinpoche, Drupon Rinpoche, Tsewang Rinpoche, the president of Karma Triyana Dharmachakra,Tenzin Chonyi, the resident lama of Karma Thegsum Choling – New Jersey, Lama Tsultrim, Lama Tsultrim Allione, and other representatives from various Dharma centers. All were looking forward to this last opportunity of listening to what the Karmapa was about to say on the eve of His departure for India. The current trip is my second visit to the United States. When I first visited this country I was very excited to be here, so much so that I wanted to come back as soon as possible. But it turns out that I had to wait about three years for the second opportunity to come here, and who knows when the third opportunity will arise? Nothing is definite, but still I have the sense that my third visit overseas will again will be to the United States of America. In both cases of my first and the present visit, I have been very warmly welcomed by both the American government and the American people. I have a feeling of being around old friends when I am in the United States. There is a great feeling of warmth and friendship, and I am very grateful for this connection. And in both the first visit and the second visit I have met with many people who have a connection with the previous Karmapa: the 16th Karmapa. So there is a feeling within me of reuniting with people with whom I had established a heart connection. There is a sense of continuity between the connections made by the 16th Karmapa and those made by the 17th Karmapa, and what this symbolizes for me, what this conjures for me in my mind, is some type of real confidence that love and friendship are very powerful forces that can remain from lifetime to lifetime. The connections and relationships that we make with other people through love and friendship don’t just last for one lifetime alone but can endure from lifetime to lifetime and become evermore deepened. So this is the kind of confidence that meeting with you all has given me. In traditional Buddhist practice there are ways of talking about the practice of great compassion and great love for sentient beings in which we use the metaphor of the sky and the planets, the stars, the sun and the moon to illustrate our commitment to be there with a heart full of love and compassion for sentient beings. We aspire that for as long as space endures, for as long as the sun and the moon remain in the sky, may we too be there with the heart of loving kindness and compassion to help sentient beings. May this connection between us and sentient beings remain. And in my own personal contemplation, I often think of the moon as the keeper of love. So the moon becomes the metaphor or the symbol of the enduring quality of love and the connection between beings of loving kindness and compassion. Even though one may not be physically present with other sentient beings, those beings can look up into the sky and see the moon, and through that connection be able to feel the love that you have for them. We mutually can feel the love that we have for each other regardless of whether we are physically present, regardless of how much time has passed since the last time we saw each other. So these are the types of aspirations that we make in the Buddhist practices of loving-kindness and great compassion, and I think that if we make this aspiration with a completely pure motivation, then this type of aspiration can really have an effect. It’s no longer just a symbolism that you are working with, but it’s really true. When I was asked to give a talk here tonight, I told the organizers to simply select whatever topic they wanted me to speak about, and then I would then speak about that. And I was doing this with the thought in mind that they would go easy on me and select an easy topic. But the topic that they selected was “compassion and the true nature of mind,” which is a very difficult topic. So I thought they would take it easy on me but they gave me a hard topic instead. I really should be looking around the room at the organizers so that I could give them a dirty look right now, but in any case I will do the best I can to say whatever comes to mind about this. From the time I was young onwards, I have always had certain admiration for the way that Americans approach life. I’ve always regarded the United States as a place where in a very unique way relative to other countries and regions in the world one can really chose one’s future path, that one has a great amount of choice over what one will do in the future and a great amount of permission to do whatever one is inspired to do with oneself and one’s future path. There is a great sense of self-determination and discernment and intelligence in this American approach to choosing one’s future. And I think that this is really harmonious with the Buddhist views in general of emptiness and dependent origination or dependent arising. When Buddhism talks about emptiness, it is not talking about a type of non-existence whatsoever, but rather the teachings on emptiness point to the notion of possibility, that anything can happen. The teachings on emptiness are about a fundamental sense of opportunity that is a part of reality, a fundamental presence of a gap or a space in which anything can occur. So this is the basic notion behind the Buddhist teachings on emptiness and dependent arising. And these teachings on dependent arising are present in all of the different vehicles in Buddhism, both the greater vehicle and the foundational vehicle. At the same time none of us can live our lives independently without depending on others at all. None of us have complete control over what will happen in our lives, because everything is interdependent upon everything else. So all the phenomena in our lives are dependent upon other things and are interconnected with other things, whether we are thinking about our own happiness versus our own suffering or whether we are thinking about becoming famous or gaining more freedom and control over our lives. All of this is dependent upon other phenomena. So at each stage of relationship that we enter into with other things in our lives, there is an opportunity for us to establish a positive connection in that relationship. Since all of the things that we relate to are mutually dependent, then it’s very important for us to try and establish positive connections, harmonious connections that will bring about improvement towards the good. And because these interdependent connections exist between ourselves and all sentient beings, in particular it’s very important for us to try to develop the heart of love and compassion in relationship with others. In our relationships with others, there is both benefit and harm. We could concentrate on the harm that has been done to us by other sentient beings, but there’s really not much profit that we can gain from that if we focus exclusively on the harmful relationships that we have or the ways in which others have harmed us. Conversely, if we focus on the beneficial connections between us and other sentient beings, then that’s something that can really bring a profit or benefit to us. It can help us increase our appreciation in our heart, increase our loving kindness and compassion. So, I think it’s very important for us to focus on our interdependent relationship with others from a positive angle, appreciating the benefit that other sentient beings provide us and also paying attention to the happiness of other sentient beings. One example that we can look at is to see how interdependence can play out in a relationship. The exchanges that happen between partners——maybe there is one partner who has a particularly strong habit of getting angry, and they may get angry very frequently and express this anger to their partner. Due to that, their partner may develop a habit of becoming angry at their partner’s anger. And then they return anger to the anger that is expressed to them, and as a result the anger just increases and increases and increases and things get more unpleasant. So what we should try to do in moments like that is to shift our response and try to transform our response so that it becomes a response that is more intentional and more directed in a positive way with the motivation of love and compassion. We can try to look at things from a different angle in order to do this. Actually, your partner who is showing this anger to you is not in a situation of being in full control of themselves; they are controlled by their own disturbing emotions. They are in a certain kind of situation, they come from a certain kind of background that has led them to this point of responding in this way emotionally. So there are various reasons why they come to express anger towards us, and they are not in full control of themselves when they do. That’s an important point we can keep in mind. This can help us do something different in our response to that. If someone were to hit us over the head with a stick, we wouldn’t get angry at the stick, we’d get angry at the person who hit us. And in the same way if our partner expresses anger towards us, we shouldn’t get angry at our partner because they are under the sway of disturbing emotions and ignorance towards the true nature of things——that is the root of that anger. So thinking in this way, we can gear our response in a fresh way from a more positive angle and see these moments of anger as opportunities to teach our partner something new, as opportunities to shift the trajectory of the relationship in a more positive way. If we can do that, respond in new ways like that, then I think we can really stand a chance of transforming our relationship in a positive way. Seeing how the other person really is powerless, really is in a state of having no freedom and no control, we can become more concerned about their welfare than our own temporary comfort, and we can be in the moment with that. So becoming more concerned about the other person’s welfare is very simple, it’s not complicated, it’s simply reflecting on how this other person who is behaving in an aggressive way is actually powerless, they are actually under the power of something else. If they were doing this completely of their own free will and being in complete control of themselves, then maybe we could blame them. But that’s really not the case. When we see this, we can come to value the welfare of others more and more. This is very important for us to try to invest a lot of energy into looking at things in this way and into seeing relationships in this way, and it’s also very important to be relaxed when we do so. If we can relax and take a calm look at the background that’s making the person behave in this way, then this is very important and can help us to transform our response. In sum, the heart of compassion is when we give rise to a desire or a state of mind that wants to free sentient beings, to extract sentient beings from a state of suffering, and at the same time, compassion is a readiness to expand upon whatever happiness sentient beings already have, so that they can enjoy more and deeper forms of happiness. And we work on these mental attitudes in stages, so that they can increase further and further. We start by reflecting on how in terms of our own desires, we only desire to be free from suffering and enjoy our own happiness. And just starting with that simple acknowledgement, we can expand the circle of that awareness further and further, in stages. The first step is to acknowledge to yourself that your own parents and family and immediate friends also have the same desires to be free from suffering and to enjoy happiness; that is their most fundamental desire. And then in stages you can expand the circle of your attention beyond that to recognize how everyone connected with your family and friends also wants only to be happy and free of suffering, and eventually you can become aware of all sentient beings having this same desire. In this way, your contemplation and your level of attention can become very vast in relation to sentient beings and can give rise to a strength of heart that wishes to free sentient beings from suffering and nurture the levels of happiness that sentient beings can enjoy. We may set too high of a bar for ourselves when we contemplate Buddhist teachings about working for the benefit of all sentient beings. I don’t think it’s really possible to arrive at a time when you’ll be able to say to yourself that you are now accomplishing the benefit of all sentient beings. It’s more a matter of dealing with what’s directly in front of you in terms of the experiences of happiness and suffering that you——and the sentient beings you are connected with——are going through. I think you can meet situations of suffering with an open heart and a readiness to do whatever you can to reduce the suffering of sentient beings, to free sentient beings from suffering. Or in the same way, be ready to do anything you can to further the happiness of any given sentient being that you meet and to engage in this kind of conduct with a heart of joyfulness, cheerfulness and delight. This is really the meaning of accomplishing the benefit of all sentient beings. So it’s basically situation by situation and developing further the readiness to help, developing further this heart of wanting sentient beings to be free of suffering and to enjoy happiness in whatever situation they are in at the present. I think that’s what ‘accomplishing the benefit of all sentient beings’ really means. I don’t think that phrase means we are going to accomplish the benefit of every single sentient being at the same time. Therefore compassion is actually a moving thing. True compassion is something that is always on the move, and something is always in a state of readiness. We usually think of compassion as something that sometimes moves, sometimes is responsive, and sometimes is dormant. We might see a very serious situation of a sentient being suffering, then we think that our compassion rises to the occasion and performs some tasks. And then, after that situation has passed, our compassion goes back to a dormant state. Then in terms of the nature of mind, the true nature of mind, I don’t know what I could say about that. It’s just there. Usually we think of the true nature of mind as something really high, and although I haven’t done a lot of practice in relation to the true nature of mind, if I speak from my own experience of this, I could say that eventually we will return to what we were bored with in the beginning and discover that was it. So we start off by thinking that what we have right now is too simple, too ordinary. The true nature of mind must be something special, something high, something prettier than what we have now. And what we have now doesn’t really satisfy our desires, it’s not very attractive to us, but if you put some serious effort into your practice, then eventually I think that recognizing the true nature of mind means returning to that place where you started with——your boring unattractive, not new, not high, mental state——and actually recognize that it has been what you’re looking for. Recognizing the true nature of mind isn’t a case of getting something new, it’s a case of recognizing what is old in some ways, what has been with you this whole time and recognizing that it is nothing other than that. So it’s not like getting some new possession. Maybe there has been a past model of the iPhone, and we wait for the next model to come out. There has been iPhone 3, now there is iPhone 4, and we are all waiting for Iphone 5 to come. We are all waiting with great hope for the iPhone 5, but I think the practice of working with the true nature of mind is one of recognizing what our current iPhone can do, appreciating the iPhone that we have now. Not only that, but learning how to use the iPhone that we have now. Sometimes we don’t take the time to learn how to use the iPhone, and then because of our lack of knowledge of how to use it, we think that it is boring, we think that it is unattractive, and we wait for the next iPhone to come out. We think that would be much better. So if we approach the nature of mind with an attitude that thinks it has to be something new, it has to be something high, it has to be something that’s prettier than what’s going on now, then maybe, just maybe, that’s a mistake. When we talk about the true nature of mind, when we say “nature,” it means the actual state, the actual situation that the mind is in. It’s simply a matter of recognizing what is there, what is actually there. So sometimes what is tricky for us to understand is that the reason we have not recognized the true nature of our mind is not because it is too profound, or too difficult. It is because it is too simple or too easy. The masters of meditation of the past say that we fail to recognize the true nature of mind because it is so simple that we fail to trust it. So the true nature of mind is simply what we are right now, it is our uncontrived natural state. Since we are in such a habit of living our lives in contrived states, and states where we are always adding concepts onto things, it’s difficult for us to return to the way we naturally are. All of us have a lot to do in our lives, we are very busy, we have to allocate our time in order to do various things in order to assume various roles. We have to perhaps give ourselves time to be a doctor, we have to give ourselves time to be an assistant to someone, we have to give ourselves time to be all kinds of different things, take on all kinds of different roles, but what we often forget is to give ourselves time to be just ourselves. And that’s what meditation is. Meditation is giving yourself time to just be yourself. There is nothing to it other than that, it’s nothing really special, just allowing yourself to relax and be yourself without worrying about what has happened in the past, or without worrying about what’s going to happen in the future. Just to simply relax and rest in your own natural state is all that you need to do, giving yourself the opportunity to do that. When you give yourself that opportunity, you’ll find that presence extends to the other parts of your life as well. You don’t lose your own true nature as you go about all of your other activities, even if your day-to-day life is busy. What sometimes happens in our day-to-day lives when we get so busy is that we spend the whole day doing various things, completely caught up in the tasks before us, but when we get to the nighttime, we look back on the day and we can’t even remember what we did. So we remember we did something but we just can’t remember what it was. And the reason that this happens is that when we get caught up in that busyness, our mind is only following after the things on the outside. It has lost its appreciation for who we ourselves are. So it’s lost the mindfulness and awareness of itself and has engaged in activities only focusing on things on the outside. In that way we come to lose ourselves in the midst of all our activities, and therefore I think it’s really essential and important to give ourselves time to just be ourselves. In America especially we invest a lot of importance in the notion of identity. The concept of identity is very important to us. We often peg our identity on the type of work we do. If someone asks a doctor “who are you?” they’ll say, a doctor. So there is a very strong sense of identity related to the type of work that we do. The identity is based on the outer world and not on what’s happening inside, on oneself becoming a basis for one’s identity. When that orientation becomes too fixed in the outside world, then serious hardships can arise. Maybe we lose our job, maybe we lose an opportunity to work as a professional in the way that we have been trained, and our response can become so extreme that we might feel compelled to take our own lives. This kind of thing happens to people sometimes. I think this illustrates the importance and the really essential need for us to turn our attention to the inside and be able to form some sense of identity on the basis on just who we are, not on the basis of what we do, externally. So when it comes to the true nature of mind, this isn’t something that we get from a spiritual tradition or religion. It’s not something that we need to seek from a guru or that we need to find by going to a sacred place, but it’s a matter of recognizing who we are, whatever that it is. When we see this completely clearly, when who we actually are becomes completely evident and obvious to us, and we recognize it and appreciate it in a completely perfect way, then that I think is what is called recognizing the true nature of mind. Then we fully make this a reality for ourselves. You have sat here through this talk, and it’s passed nine o’clock. I don’t think it would make much sense for me to continue my lecture, but perhaps if you have any questions, and if the questions are easy, I can answer them. And then if the questions are difficult, then I can say we have run out of time. Maybe we can have five questions. Question 1: The level of our study and the level of our practice may be different from our experience. Until our experience catches up to our understanding, how do we work with the gap between our intellectual understanding and the evolution of our experience? This is a difficulty that we all experience trying to make our experience achieve the same level as our intellectual understanding. So I think what’s most important is to recognize that practice is about relating with where we are right now, relating with our current situation and the truth of our current situation, and it’s not good to let too many ideas get in the way of that. If we let too many ideas get in the way of our current situation, then what happens is that in traditional language, we would say that the dharma and the person have become separate things. Whereas we want the dharma and the person to be one thing; we don’t want there to be a gap between the dharma and the person. So that’s why the dharma has different stages. There are different stages in the practice of dharma because there are different levels in our experience as people. If there weren’t different levels in our experience as people, then all dharma already would be the most profound dharma. But the dharma is not what needs to attain enlightenment; it’s the person that needs to attain enlightenment. That’s why your practice should match the level of your current experience. That’s very important. And then of course from the side of study or hearing and contemplation, it’s fine for us to study all kinds of presentations of various philosophies like the view of emptiness, the journey through the paths and bhumis, and so on. But we need to stay mindful that this is study, we need to recognize philosophy as philosophy and have that be in its proper place in our understanding. It’s fine for us to study the view of emptiness, but we should also be mindful if our experience hasn’t reached that level. And if we can’t make that distinction then there is the danger of falling into the extreme of pride. For example, some people who have heard some teachings about Dzogchen or the Great Perfection might adopt an identity of being a practitioner of the Great Perfection, even though their experience hasn’t reached that level. So if someone asks them, “who are you?” and they say, “I’m a practitioner of the Great Perfection.” They think they are most perfect being, excellent being. They think that actually the most perfect thing is themselves, so they fancy themselves as being a great piece of perfection. When they talk about themselves and their practice, their voice deepens, and they take on very handsome physical demeanor, but it’s very dangerous if their experience hasn’t reached that level. Then they are just left in a state of confused pride. Question 2: Are you personally aware of the connection that we actually have from moment to moment, or is it just your aspiration? Is your awareness of sentient beings present in every moment of your experience? In my experience, my awareness comes and goes, but is your connection with us always present? Is it that all I have to do to connect with you is tune in to your continuous awareness of me? HHK: I don’t purport to be continually aware of all the connections that I have with all sentient beings, not like speaking to each telepathically on the telephone. Maybe when someone thinks of me, it does change of the way I feel, but I might not be aware that is the case. Your question seems to be mostly framed around connection and relationship as an action that takes place, but I think that the way I was talking about the contemplation of the moon as a metaphor for love was more pointing to the natural state of relationship that already exists between beings, between us and between all sentient beings. I am not always directly aware of the connections I have with sentient beings, and sometimes connections are strange and hard to understand. Sometimes people tell me that I show up in their dreams even though they have never met me before or have never even met a Tibetan lama. So connections in this way are strange, and I don’t perfectly understand the phenomena of connections. What I was saying is that there is a natural connection of love and compassion, and I always have a consistent aspiration to have this connection of love and compassion with sentient beings from lifetime to lifetime, for the long haul. It’s not just a temporary presence of loving kindness and compassion between us but a continual presence of loving kindness and compassion. I wasn’t trying to imply some sense of clairvoyance or higher cognitive powers but that the presence of loving kindness and compassion is stable and sincere, and it is always in a state of readiness. Question 3: I want to ask about a method we can use to directly dissolve the perception of the self and others as different and separate. HHK: From a certain perspective, we can say that others and ourselves are separate entities, but on a more fundamental level, as I mentioned earlier, we all equally desire to be happy and we all equally desire to be free from suffering. That’s really the fundamental reality that makes us equal, that makes self and others equal. I think that’s the fundamental reality that is important for us to reflect upon and remember. What is out of touch with reality is the thought that others don’t want to be happy as much as I do, or others don’t happiness at all. That’s a really distorted view. So I think that in order to get to the point of your question, the advice would be to practice meditation on self and others. Question 4: In light of what you said about not be able to benefit all beings simultaneously at all times, is it then unrealistic for us to take on the Bodhisattva vows, which ask us to make such aspirations? Will there ever be a time when all sentient beings achieve liberation? HHK: Well actually, sentient beings are limitless, are truly infinite in number; the number of sentient beings has no end, so there actually will not come a day when there are no more sentient beings. The other side of this is that the Bodhisattva aspirations are infinite and limitless, and there will never come a day when the Bodhisattvas’ aspirations end. So there is never a time when the Bodhisattvas will say “bye-bye, it’s the end of the world. I’m out of here,” because sentient beings are endless, and the Bodhisattvas’ aspirations are endless, and furthermore, Bodhisattvas are unafraid of the fact that sentient beings are limitless. They don’t lose heart. In fact, that makes their strength of heart grow even stronger, their desire to benefit others and practice the conduct of Bodhisattvas becomes even stronger, and this is actually a good thing. If we ran out of sentient beings, that means the Bodhisattvas would lose their jobs. And that wouldn’t be good, and so it’s not really a bad situation that there is no end to sentient beings. The important thing is how we approach the endeavor of wanting to accomplish the benefit of sentient beings. (Ironically, it’s approaching the time for me to say “bye-bye” for the night. Question 5: Can His Holiness please give us a practical method that will enable us to return right to the spot of the present moment and realize our true nature in the very midst of being in the middle of busy activities? HHK: Well, in general as I mentioned before, it’s very important to remember basically who you are and not be overwhelmed by whatever situation is taking place currently. Usually we do the opposite, and we allow the situation to overwhelm us, but we can situate ourselves so that our mindfulness and awareness are actually hovering above whatever situation we are in, so that we are not completely overwhelmed with or drawn into the situation itself. I think it’s very important to have that sense of space or gap between ourselves and the content of the situation we find ourselves in. For example, someone who knows how to swim found themselves tossed into a pool of water all of a sudden. If they didn’t keep their calm, then they wouldn’t be able to bring forth the ability to swim. They would instead splash around in the water in a state of panic, But if they were able to relax on the spot, then that situation would become like an ornament or an adornment to them. So having some sense of spacious gap in any situation is very important. The teaching is finished. Thank you, thank you, thank you. In closing, I’d just like to say that I am very grateful to you all for taking the time to come here tonight. I extend my prayers of auspiciousness to you, and I hope that we can meet again and again in the future. In particular, I hope that I can come to the United States again and again to see you, and that may entail some difficulty, but I am going to try.